USC Thornton alumna Annie Bosler (MM ’05, DMA ’08) recently published a guidebook on the application process for music schools and conservatories. Entitled College Prep for Musicians: A Comprehensive Guide for Students, Parents, Teachers, and Counselors, Bosler and her co-authors – Kathleen Tesar, associate dean for enrollment management at Juilliard, and psychologist Don Greene – decode the complex process of choosing schools and clarify the vocabulary around the admission process for young musicians applying to college. 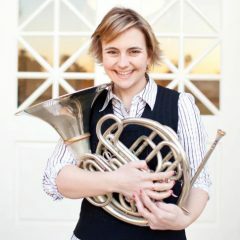 Bosler currently teaches French horn at a number of institutions including Cal State University, Northridge; Pepperdine University; University of California, Irvine; Pasadena City College; and El Camino College.